Amazing Capabilities: Sticky menu, icons, awesome dropdowns, logo and search – may be present in one menu. Unlimited Colors Variations: You can easy change color for any menu element. You can use flat colors, gradients and background images. 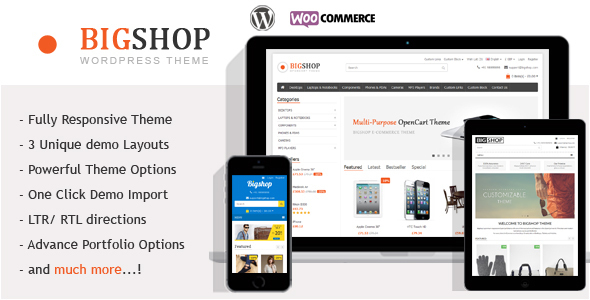 Dropdowns: 10+ combinations: Customise dropdown so easy with Mega Main Menu. You can place any content in dropdowns menu links, text, images, widgets and shortcodes. 1600+ Vector Icons:Use 1600+ icons in your menu and website. Vector icons are sharp graphics which will look great on any devices with any resolution. 600+ Google Fonts: You can choose from more that 600 google fonts for your menu. Change font very easy from your admin dashboard. 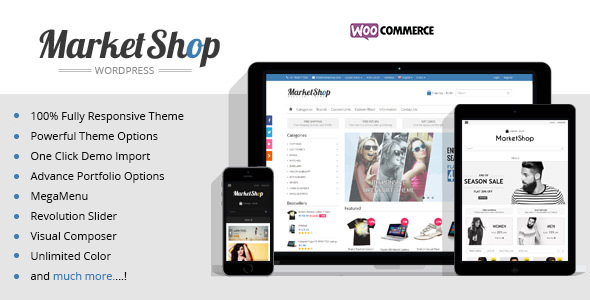 Marketshop theme was created to make it easy for users to have control over the design, layout of their site with no code required. ADDED: New 6 demos with RTL Demo. UPDATED: Mega Main Menu Plugin. FIXED: Some custom jQuery issues. ADDED: Examples slider for revolution.